Got berries? If you’re like me, it’s impossible to resist the baskets of fresh summer berries at the farmers’ market. If you have more restraint than me and you haven’t gobbled your berries up yet, here’s a great way to add them to a dessert. Clafoutis is a French flan-like dessert consisting of fresh fruit baked in a custardy batter. It’s light and elegant, gently sweet, and redolent with your favorite fruit. Berries work well because their juices seep into the clafoutis while it bakes. You can also use cherries, plums, and pears. 1. Preheat the oven to 350°F. Butter 8 (6-ounce) shallow ramekins (or 1 (10-inch) ceramic tart pan). Sprinkle the ramekins with the 1 tablespoon granulated sugar and tap out any excess. Place the ramekins on a baking tray. Arrange the berries in one layer in the ramekins. 3. Pour the mixture over fruit. Transfer the clafoutis to the oven and bake until the top is tinged golden brown and the custard is set, about 25 minutes for the ramekins (or 35 to 40 minutes for the tart pan). Remove from the oven and cool on a rack. 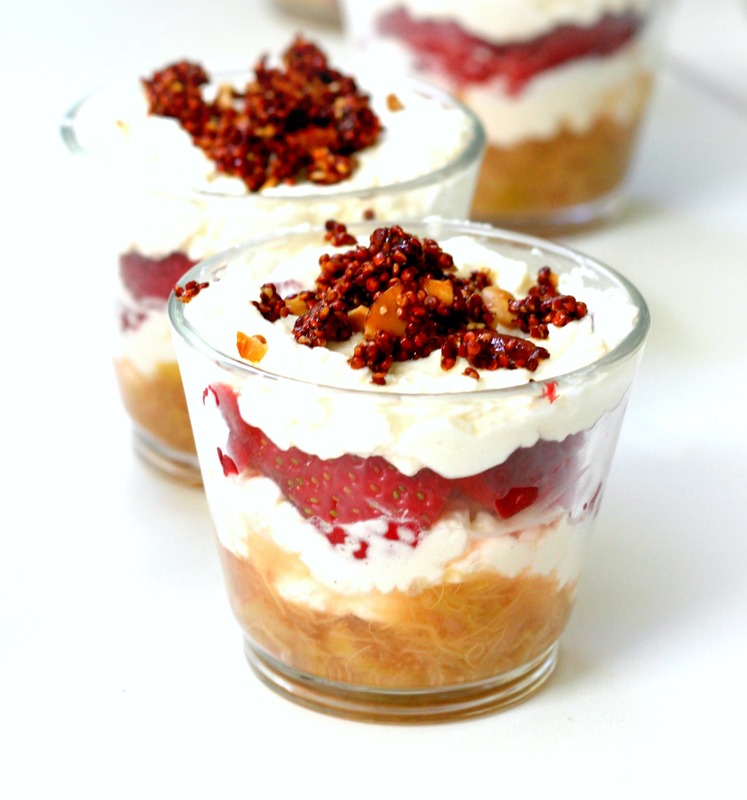 Trifles and parfaits are a great way to show off the season’s best fruit. I like to assemble them in little glasses, so the layers are visible and the servings aren’t too large. They can be as simple as fruit and cream, but I often add a little crunchy texture, such as crumbled meringue or a sprinkle of streusel. In this recipe, I’ve made an almond and toasted quinoa streusel. The nuttiness of the quinoa is a great match for the tart rhubarb. This recipe makes about 6 large servings or 12 small servings, depending on the size of your glasses. Combine all of the ingredients in a medium saucepan. Cook over medium heat, stirring frequently, until the sugar dissolves and the rhubarb releases its juices. Reduce the heat to medium-low and simmer until the rhubarb softens and the compote is slightly thickened, about 20 minutes. Cool and refrigerate until use. Preheat the oven to 300°F. Toast the quinoa in an ovenproof skillet over medium heat for 2 minutes, stirring occasionally. Remove from the heat and stir in the almonds and coconut. Whisk the syrup, oil, vanilla, cinnamon, and salt in a small bowl. Pour over the quinoa and stir to combine. Spread the streusel in the pan and transfer to the oven. Bake until deep golden brown, about 25 minutes. Remove and cool. Combine the cream, sugar, and vanilla ingredients in the bowl of an electric mixer. Beat on high speed until soft peaks form. Spoon a layer of rhubarb into serving glasses. Top with cream. Add a layer of strawberries over the cream and top with more cream. Garnish with the streusel. Serve immediately or refrigerate for up to 1 hour before serving. Upside-down baking is irresistable to me, whether it’s in the form of a tarte tatin or a cake. The common denominator is a gorgeous, gooey caramelized bottom, which, once inverted, becomes the top. Nestled in the sticky caramelized goodness are hunks of seasonal fruit, which release their juice and perfume the pastry, while studding the topping like jewels in a crown. The other winning quality of upside-down desserts is that they are generously flexible with the seasons. In the fall, pears and apples are the fruit of choice. In the summer, stone fruit, figs and berries display their wonders. Mix and match to your taste. It’s impossible to go wrong. 1. Preheat the oven to 350°F. Butter a 9-inch springform pan. Line the bottom with parchment and butter the parchment. Tightly wrap the bottom of the pan with foil. 2. Melt the 1/2 cup butter and the light brown sugar together in a saucepan over medium heat, whisking to combine. Pour into the springform pan. 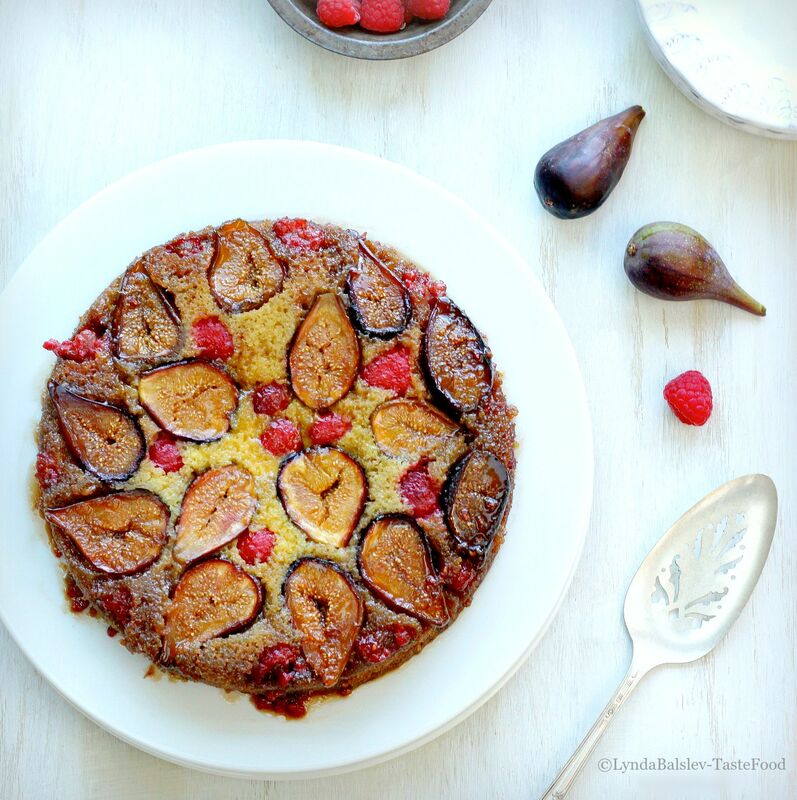 Arrange the figs, cut side down in a circular pattern in the sugar. Fill in the gaps with the raspberries. 3. Mix the flour, almond flour, baking powder, baking soda, and salt in a medium bowl. Whisk the sour cream, lemon zest, vanilla and almond extracts in a small bowl. 4. Beat the 3/4 cup butter and the granulated sugar in a mixer with a paddle attachment until light and fluffy, about 3 minutes. Add the eggs one at a time, beating well after each addition. Mix in 1/4 of the flour mixture to blend. Add the sour cream mixture and mix to combine. Add the remaining flour mixture and mix to thoroughly combine without overmixing. 5. Drop the cake batter over the fruit in large spoonfuls, then carefully spread the batter to cover the fruit and caramel. 6. Bake the cake in the oven until a toothpick inserted in the center comes out clean, about 45 minutes. Cool on a rack for 10 minutes then invert onto a plate. Serve slightly warm or at room temperature. It’s summertime and the living is easy. 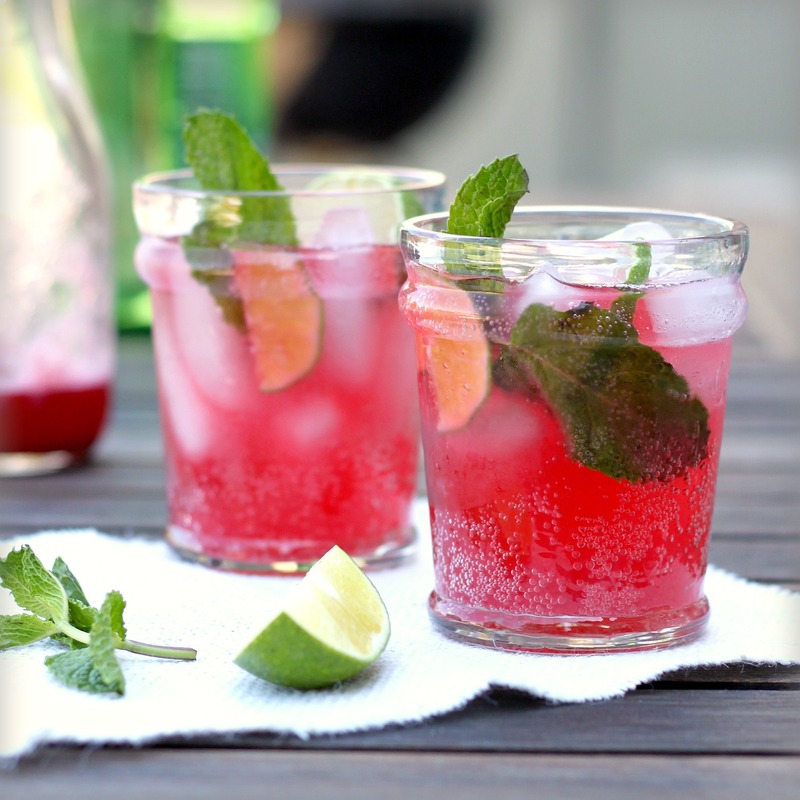 And what better way to enjoy the sultry season than with a refreshing, thirst-quenching drink? During this window of time when berries are prolific, I like to make a syrup which I add to drinks. Depending on the mood or time of day, I’ll stir a few spoonfuls of the vibrant, tangy syrup into icy glasses of Prosecco or sparkling water. If we’re feeling extra festive, I’ll muddle a jigger-full with mint, lime and rum and call it a mojito. The following recipes call for blackberries, but raspberries are a great substitute. And if you’re lucky enough to have a bunch of black currants growing in your garden, then go for it. Combine all of the ingredients in a saucepan. Bring to a boil. Reduce heat and simmer until blackberries soften and release their juices, about 10 minutes. Cool. Purée in a food processor, then strain through a fine-meshed sieve. Discard the seeds. Fill a wine or cocktail glass with ice. Add syrup and sparkling water. Stir. Garnish with lime and mint. Muddle 2 lime wedges, mint sprigs and syrup together in a sturdy highball glass. Fill the glass with crushed ice. Pour rum over ice. Top with sparkling water to taste. Garnish with whole blackberries, remaining lime wedges and mint. It was one-stop shopping at the farmer’s market this weekend. A little rickety table in the far corner of the maze of our Sunday market was lined with pint-sized cartons seeping with blue-violet blotches. They brimmed with wild raspberries, blueberries, and – best of all – boysenberries, a tart flamboyant cone-shaped berry resembling a floppy blackberry. Next to the berries was a wide wicker basket filled with dainty upright rhubarb stalks awash in green and fuschia. The message was clear: Come and get it. And so I did. I made this dessert for our dinner guests that night, one of whom is gluten-free. The topping was crisp, nutty and sweet, faintly spiced with cinnamon – delicious for gluten-free and gluten-lovers alike. Serves 6. Preheat the oven to 350°F. Combine all of the topping ingredients, except the butter, in the bowl of a food processor and pulse to coarsely chop the walnuts. Add the butter and pulse until the mixture resembles coarse meal. 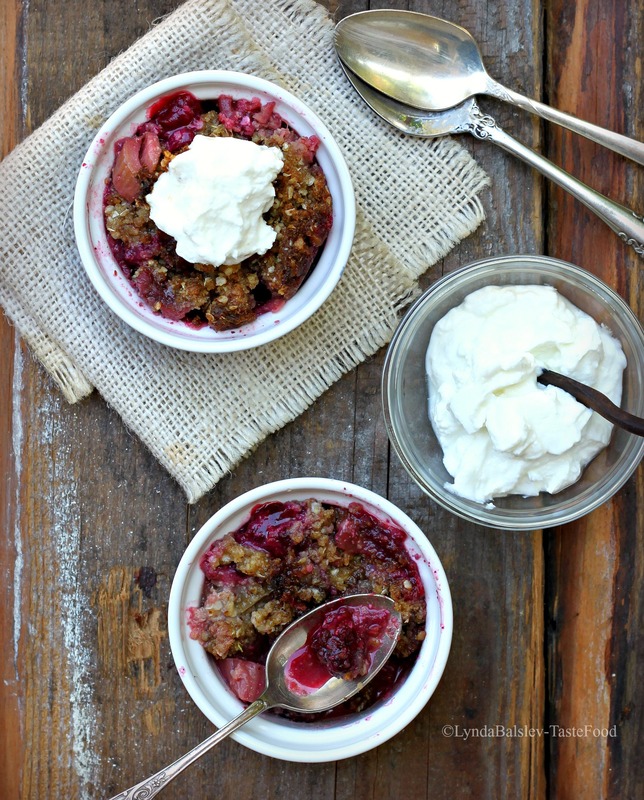 Place the rhubarb and half of the boysenberries in an 8 x 8-inch (or similar size) baking dish. Sprinkle the sugar over and gently mix to combine. Whisk the orange juice and cornstarch in a small bowl. Pour over the fruit and gently stir to coat. Arrange the remaining boysenberries over the top of the fruit, then evenly spread the topping over the fruit. Bake in the oven until the topping is golden brown and the fruit is bubbling, about 45 minutes. If the topping browns before the filling is fully cooked, then loosely cover with foil to prevent burning. Remove and cool. Serve slightly warm or at room temperature with whipped cream or vanilla ice cream.